We have been asked a number of times how, and if, we are different from other platforms that also engage in anti-counterfeiting. While our answer is yes, let us explain how. To better understand the difference between us and others, one needs to know that the journey of a product starts from sourcing of its raw material through the manufacturing phase and then to packing and distribution until it finally reaches the consumer. Unscrupulous activities can happen at any stage of this product lifecycle. While many companies have a supply chain counterfeit solution, we look at our solution as a distribution channel model. Supply chain counterfeit solutions platforms are technology providers. They work closely with manufacturers to authenticate their products by attaching a tamper-proof RFID chip (or barcode or an e-label) that is unique to each item. The consumer can scan this chip using their app and find out the authenticity of the product. Thus these products cannot be tampered with within the supply chain. If they are, the chip is damaged and when consumers try to scan it to find its authenticity, they cannot. Also, fake products of the same brand will not have this chip. So once the product leaves the manufacturer’s warehouse, they are safe within the supply chain and reach the consumer safe and unadulterated. This system increases the costs of the products by around 20%. While some customers will agree to pay a premium on the product in lieu of assurance of their authenticity, most customers who are price sensitive may not like the idea of paying more. simplyBrand, on the other hand, is a unique platform that detects fakes at the online marketplace level, the last mile before the product reaches the customer. The step where the consumer buys the product for consumption is the final step in the product lifecycle. 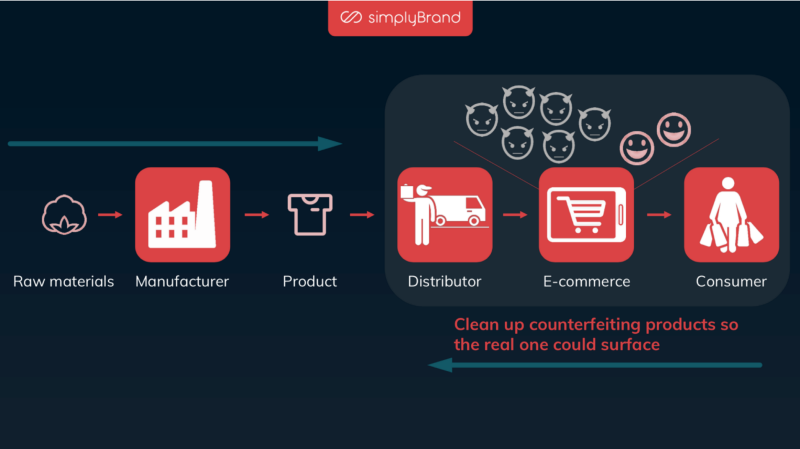 This is where simplyBrand seeks to create a hurdle so as to make counterfeiting difficult owing to economic and reputation losses on the part of online platforms selling fakes. 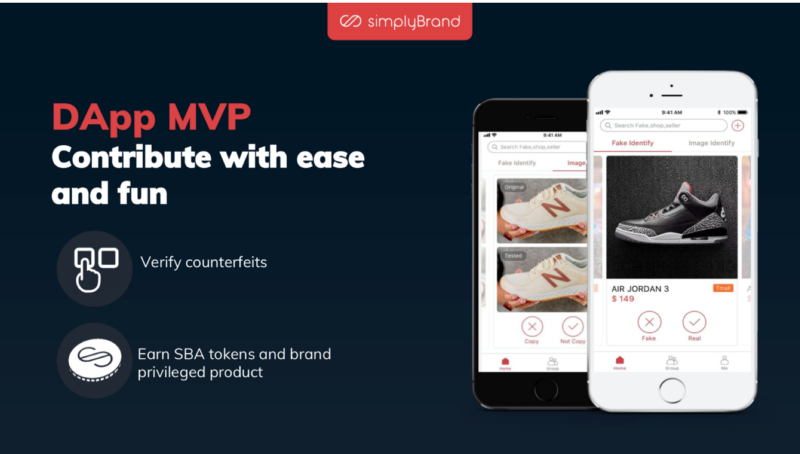 simplyBrand is the world’s first distribution channel blockchain-powered anti-counterfeiting solution. 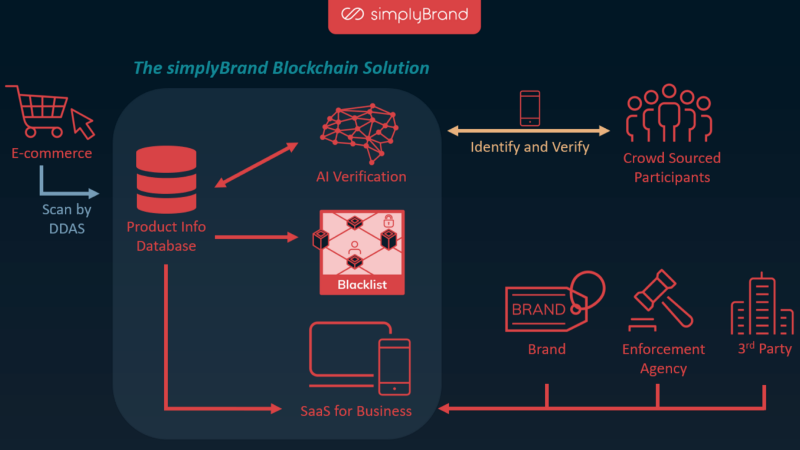 simplyBrand is the world’s first blockchain solution focusing on online market place to fight counterfeit products combining AI, blockchain and crowdsourcing. Also, simplybrand’s solution works only for online retail where counterfeiting is a menace worth more than $323billion in 2017. The simplyBrand solution engages the help of AI, blockchain tech and human intervention to detect and report fakes. A “blacklist” will be created and put up on a public blockchain that will be accessible by everyone. Enforcement agencies can obtain info from the platform and then take relevant action on online platforms by taking down the URLs of merchants selling fakes. Brands can take the help of simplyBrand’s solution by registering on the platform. There is no added cost for technology (like RFID, barcodes or labels of any kind) and fake products are caught at the final step leading to increase in operational costs of counterfeiters and generally making lives difficult for them. Our unique system covers multi-channel e-commerce sites and real-time tracking. It automatically detects, reports, and takes actions to take down counterfeits. The system also keeps track of URLs that were reported by crowdsource and take down. At simplyBrand, we invite customers to participate in our anti-counterfeiting activities and be rewarded for it. This vital human layer will also help train our AI and make it more efficient. Our DApp is already out and can be accessed here. You can see how intuitive this app is and how easy it is to use it. Its gamification meets high-end tech to fight online counterfeiting. Using cutting edge AI tech along with human intervention, this DApp can help in spotting and reporting counterfeit goods on online stores. Users will be rewarded for helping in successfully spotting fakes. You can read all about how the DApp works in this article. We hope we have been able to clarify our solution and how it is different from other platforms in the market. If there are any questions, feedback or ideas that you would want to share with us, please join our official Telegram. If you already are a community member, just shoot us a message to know what you think of this article.